The brochure emphasizes the growing importance of ecological factors in road construction due to environmental considerations in politics and society. 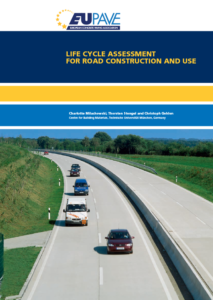 The study is based on the evaluation of environmental impact of motorways, that is performed through a life cycle assessment according to ISO 14040. The research presented in this publication is rewarded with the “Best Marketing Paper Award” during 11th International Symposium on Concrete Roads, Seville, Spain.